They're currently on the road with Cattle Decapitation, Prong and Mutiny Within, but right after Soulfly wrap up their tour Oct. 25 in Albuquerque, N.M., frontman Max Cavalera will return to the rehearsal room to continue writing the follow-up to 2008's 'Conquer.' "I wrote a lot of riffs the last couple months before we started this tour," Cavalera tells Noisecreep. "The plan now is to enter the studio in November and have the whole album done by the beginning of next year." At the moment there are no complete songs, but Cavalera has skeletons for about eight tunes and he's got a good idea where the album is headed. "I think it's gonna be in the same vein as 'Conquer,' but more energetic," he says. "The songs will be a little faster and shorter too, so it will be more aggressive and more in your face. There's a lot of energy from what I've got so far." 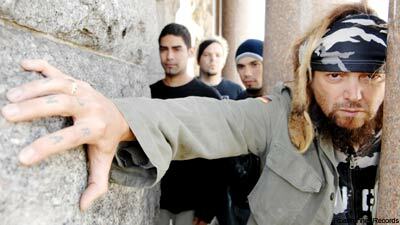 "I like the work we did with Logan a lot," Cavalera says. "I think he's got a really good ear and he's a really easy guy to work with. So doing this new one with him should be a lot of fun." The album will feature the lineup Soulfly has had since 2004: Cavalera, guitarist Marc Rizzo, bassist Bobby Burns and drummer Joe Nunez. "We've gone through a few guys over the years, but I feel like I found some musicians I really like, and I get along really well with them. And they all bring something to the table. So it feels right to have them now."